Fatima El-Tayeb. 2011. European Others: Queering Ethnicity in Postnational Europe. (Minneapolis: University of Minnesota Press): 253 p. ISBN 9780816678556; 0816678553. In European Others, Fatima El-Tayeb explores questions of race, boundaries of “Europeanness” and resistance to them by centering Europeans of color who remain invisible in popular and academic discourses. El-Tayeb states that racialization is a tool of differentiation of Europeans for insiders and outsiders within the continent while maintaining its investment in whiteness as the inherent norm of Europeanness. Whereas claims to whiteness are also differentiated within the continent, El-Tayeb includes groups of Eastern and Southern European descent as racialized minorities in Western Europe to emphasize the ethnicization of labor. Stating that the book focuses on continental Europe rather than national formations, El-Tayeb points to a continentwide pattern of racialization and analyzes border-crossing cases from Western Europe. El-Tayeb argues that race is “both at the center of postwar European identity and doubly invisible” (p. 6). In particular, race is associated with nonwhite populations who are situated as external outsiders to Europe. Europe’s narrative is constructed on the exclusion of colonialism from its history, allowing the ideology of Europe’s racelessness. Therefore, the connection between Europe’s history of colonialism, racism, and labor migration is routinely denied. The disremembering of the colonial past shapes the contemporary perception of Europe as a progressive well-intentioned neutral mediator. Moreover, this colonial amnesia produces Europeans of color as outsiders and “aliens” threatening to the liberal continent’s identity. Furthermore, the eugenic politics applied to different European populations during World War II are deracialized and detached from contemporary exclusions as lessons learnt in the past. Thus, Europe positions itself as a progressive entity, untouched by matters of race, and “raceless,” where racial Others are imagined as always outside and the presence of race is deemed nonexistent within European thought. Such imagination and colorblindness allow for the silencing and constant externalization of the legacy of colonialism and racism, whilst maintaining the image of Europe as a progressive and benevolent entity. Thus, racialized Europeans are forever “just arriving” and forgotten in the construction of a contemporary European identity. The book gives examples of continent’s Roma and Sinti populations who have resided in Europe for half a millennium and are constantly marginalized as foreigners. The othering of Muslim populations also follows the pattern of externalization, forgetting the history of racialization of religion in Europe. Thus, El-Tayeb delineates a specifically European form of racialization that is simultaneously manifested in a discourse of colorblindness that allegedly does not “see” racialized difference and in silencing those who fall out of Europe’s normative whiteness and categorizing them as non-European Others, deeming the “race question” as externally imposed (especially from the U.S.). Therefore, the other line of the book’s theoretical inquiry is the strategy of diasporic queering ethnicity, employed by racialized populations, that goes beyond essentialized notions of ethnicity, nationality, and identity and builds coalitions to counter Europe’s colonial amnesia and the erasure of racialized Others from existence: “[q]ueering ethnicity has the dual function of inserting European minorities into the ongoing debate around the continent’s identity and of reclaiming their place in its history, the creation of alternative archives working as a bridge between the two” (p.174). 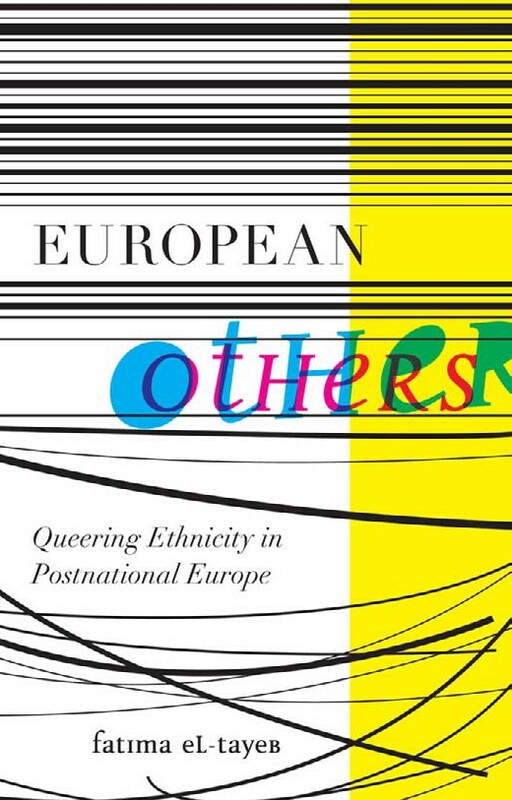 El-Tayeb traces the activism of queer groups that counters binaries and the construction of normative Europeanness, analyzing incidents when racialized populations who are unthinkable in the imagination of Europeanness show up without apologies and intentions to leave and, moreover, demonstrate their presence and embeddedness in Europe’s past and present. In her analysis of forms of resistance, El-Tayeb follows Hall, Balibar, Goldberg, and others to argue that articulating the mechanisms of exclusion is not necessarily sufficient for Europe, since attempts to identify racist structures as an act of racism may be dismissed by the logic of colorblindness, through which Europe constructs itself as benevolent and progressive by disremembering and externalizing race and colonialism. For example, such attempts can be dismissed due to the fundamental attachment of discourses on race to the U.S. and thus allegedly having nothing to do with Europe or the association of debates around race exclusively with right-wing extremes disconnected from the European mainstream discourse. Therefore, El-Tayeb points out “political racelessness” to examine the challenges it presents to the dominant understanding of racialization, as well as the resistance to it employed by racialized Europeans through “representing the unrepresentable in the European model” (p. xxix). The book centers hip-hop artists, feminist organizers, queer performers, and migration activists to explore the efforts of racialized European populations to debate what it means to be European and uncover a history of race in Europe, where people of color are insiders. El-Tayeb argues that such strategies of resistance to the system of racelessness offer “insights into postethnic configurations of identity that react to globally changing socioeconomic conditions” (p. xxiii). As the experience of migration and often of European colonization shapes interactions between different racialized communities originating in Africa, Asia, the Middle East, and even Eastern Europe, the resistance to European racialization goes beyond the essentialized logic of ethnicity and nation. The book draws on a creolization of theory, grounded in a methodology developed in the Caribbean context, and on women of color feminism, African diaspora studies, and queer of color critique to grasp the mechanisms of European racelessness. El-Tayeb builds on the pioneering work on European racism while placing racialized populations and their strategies of resistance at the center. Engaging with Muñoz’s theory of disidentification, El-Tayeb uses “diaspora” to bring aspects of “migration” and “minority” together in order to understand the experience of migrants born in a European country, but never having fully become a part of it, and to embrace the transnational ties of migrant populations, thus to think of a strategy that neither aims to assimilate nor strictly oppose the dominant ideology. El-Tayeb suggests that by extending the perception of diaspora towards dislocation directed at the future, it mirrors the possibilities of queering ethnicity as a nonessentialist political strategy. The author understands queer as oppositional to the heteronormative discourses of nation and migration, as well as to the homonormative politics of mainstream gay organizations, and sees its strength in “using the tension of living supposedly exclusive identities and transforming it into a creative potential” (p. xxxvi). The book shows that a creolization of theory can embrace the positionalities considered impossible, in particular, Europeans of color, while including economic analysis often ignored in cultural studies of migration in Europe. Overall, the book uses different terms and concepts that foreground various aspects of spatial and temporal relationships between Europeanness, national boundaries, diaspora, memory, and identity and relate them to art, music, performance, and literature. Standing on nonessentialist positions, the book points to the radical postethnic cultural activism around sexuality, ethnicity, gender, and nationality, originated in the racialized groups that contemporary European discourses portray as essentially backward and unprogressive. Importantly, El-Tayeb notes that the approach of diasporic queering ethnicity does not necessarily translate into subversive politics, but nevertheless it reveals an attack on the European raceless ideology that often focuses on the trope of the migrant as a threat to Europeanness. Europeans of color, by practicing the strategy of speaking from the position of racialized subjects, emphasizing the process of Othering, create conditions for a Europe-wide postethnic activist network of resistance. The book maps the conditions under which such activism emerges, suggesting some hope for alternative worldviews. It is also important to note that although the book claims to address a continentwide pattern of racialization, it analyzes the raceless ideology and colonial amnesia of Western European countries that position themselves as a European norm and an ideal of progress. While this analysis points to the power relations dictated by dominant European countries (such as France, the Netherlands, Germany, and Austria), the discussion of forms of racialization in Eastern Europe can contribute to a more comprehensive understanding of continentwide patterns of racialization. For example, Imre (2005) explores whiteness as a heterogeneous concept within Europe, contests the conflation of white and colonizer, and examines Eastern European countries’ claims to whiteness as a tool of asserting Europeanness. Stating that whiteness is not a monolithic concept, Imre emphasizes that the countries of Eastern Europe belong to cultures that are predominantly white and have not directly participated in the processes of colonization and imperialism, therefore, most people in Eastern European countries may insist that questions of race are not relevant to the region (p. 80). Although the category of whiteness and its politics remained unmarked and unquestioned, whiteness is rooted in the constitution of Eastern European national identities. For example, an exploration of the situation of Roma people within Eastern Europe allows to examine how whiteness, specifically Eastern European nations’ claims to and unspoken insistence on whiteness, provide legitimacy to Europeanness: “[j]udging by the recent racist outbursts of ethnic nationalism in Eastern Europe and the former Soviet Union, the question appears to be less whether discourses of colonization, race, and, in particular, whiteness, are relevant to the functioning of East European societies, but rather how such discourses have managed to stay submerged for so long” (Imre 2005, 81). Imre gives the example of Hungary, where it may be “acceptable to use the phrase ‘It’s not for white people’ to describe hard physical labor, and it is considered to be free of contradiction to say, ‘I hate Gypsies, but I am not a racist’” (Imre 2005, 83). Similarly to the European imperial pattern, the Eastern European construction of whiteness may assert its legitimacy and power at the expense of and by projecting backwardness onto racial Others. All in all, the book European Others, by pointing out race as inherent to current European thought, disrupts the dominant narrative of Europe as a raceless continent and reminds that the concept of race and race-based policies inherent to colonial empires originated in Europe and were exported all over the world, while Europe remains marginal in discussions of race and racism, especially in relation to the U.S., which is regarded as a center of racism. The book contributes to scholarly and activist discussions of European forms of racialization that obtain little attention because of their deviation from the dominant discourse around race, whereas racelessness maintains racial thinking and its effects invisible. In its discussion of race, the book situates Europe within the wider context of colorblind ideologies and characterizes it by the combination of race and religion, and the externalization of racialized populations, while producing a homogeneous European entity, however, portrayed as an “inclusive” and “postnational” community. In addition, the book contributes to the critical discussion of blind spots in European migration studies and ethnic studies that lack a comprehensive consideration of second- and third-generation migrants, perceived as permanently outside of the contemporary European body, excluded from Europe’s past and present. Engaging with the notion of diaspora and the concept of queering ethnicity, the book moves beyond the binary of citizen and foreigner, an essentialist understanding of ethnicity and models of identity. Moreover, while the studies of the cultural productions of European minorities have mostly focused on mainstream forms of art, the book focuses its attention on the less respected spheres of vernacular culture and public art, creating a new type of cultural archive with a variety of cultural texts (spoken word poetry, drag performances, wearing of the hijab by some European Muslimas, etc. ), inserting racialized populations into the European body. Imre, Anikó. 2005. “Whiteness in Post-Socialist Eastern Europe: The Time of the Gypsies, the End of Race.” Postcolonial Whiteness: A Critical Reader in Race and Empire, ed. by A. J. Lopez, 79-102. Albany: State University of New York Press.